Talk show host Ellen DeGeneres, 48, reprises her role as the voice of the forgetful fish, who was first introduced to audiences in the Academy Award winning “Finding Nemo” in 2003. Despite her frequent (and humorous) memory lapses, Dory helped Marlin, a clownfish, find his missing son. This time around, it’s Dory in search of her long-lost parents. She gets an assist on her quest from her pals Nemo (voiced by newcomer Hayden Rolence) and Marlin (Albert Brooks, reprising his role). They also make a host of new friends along the way. Andrew Stanton, who co-wrote and directed the original animated adventure, returns to helm and co-write the family-friendly sequel. Why it took Disney/Pixar more than a decade to make a sequel to the box office and critical animated hit is anyone’s guess. For years, DeGeneres wondered about it on her TV show. She didn’t expect her character to take center stage in the sequel. The pixie-like comedian and outspoken gay rights advocate (she is married to actress Portia de Rossi) was not taking the bait when the question of a possible lesbian couple appearing in a scene of “Finding Dory” came up during a recent press conference. Instead, she deflected it with a quip about the character’s bad haircut. Q: Have you battled forgetfulness in any form in your life? If so, how have you dealt with it? DeGeneres: Well, I take Ginkgo Biloba whenever I remember. I don’t understand how they tell you take medicine to remember things because you wouldn’t remember to take the medicine. I do have a little problem with memory but not as bad as Dory does but I don’t try to do anything about it because it’s who I am and I just try to live in the moment and hold on to these few moments that I have. Q: Is there a gay couple shown in the movie? DeGeneres: I don’t know that there is and I didn’t know anything about it until I heard this rumor and when I watched the premiere last night I was looking for that particular scene and it appears that there are two women, one has a very bad short haircut, which I find very offensive. If that’s your definition of a gay woman then how dare you. Just because someone has a short, bad haircut doesn’t mean that she’s gay. It’s just a bad haircut. So, I don’t know that that’s the case but I think if you see the movie several times, which I recommend, if you see it four or five times, there are some gay fish in the background that you’ll notice. A lot of them look very gay to me and it’s not obvious until you see it a few times. Q: When a conversation does begin over a presumption that two women are gay, is that a good thing that we’re talking about this and it’s coming up whether it’s there or not? DeGeneres: I personally think it’s a great thing. Everything that we see in the media whether it’s television or film or anything you see should represent what’s happening in the world. I think everybody that is in the world should be seen and represented so yes it’s a great conversation and whether they intended it to be a woman with a bad short haircut being gay or not I think it’s a great thing. Q: You crusaded on your show for a sequel to “Finding Nemo.” Do you take some of the credit for helping make “Finding Dory” happen? DeGeneres: I want to say that obviously in your reinforcing this, I’m responsible for every penny that this film makes because this film would not happen had I not campaigned as hard as I campaigned. Thank God I had a talk show to talk about it. I had a platform. It just seemed like it was obvious. The film was an iconic film. It won an Academy award. I was a small part of it. I wasn’t campaigning to have a sequel for Dory. I was campaigning to have a sequel to a great movie and when it didn’t happen for five or six years I just decided to make a joke of it. It seemed like it was never going to happen so I just continued to joke about it. Then, the joke became a reality and it became about Dory’s parents so again I’m responsible for every single thing that happens from now on. Q: What trait of Dory’s would you love to have? DeGeneres: I would love to have every trait of Dory’s. I try to have as many traits as she has as far as optimism and perseverance and non-judgment and not having any resentment or holding onto anger. She doesn’t feel like a victim. I think that’s why she’s such a lovable character that Andrew created because she just thinks everything is possible and she never, for a second thinks that anything’s wrong with anybody else or herself. She just keeps swimming. I think that’s a great thing so I like all of those traits. Q: What were your thoughts at the time when you were Dory in the first movie and did you feel that there was a lot more of her story to be told and did you wonder what had happened to her? DeGeneres: No, I really didn’t and had I thought about it. I would have done what Andrew (Stanton, the director) did. I’d think about where did she come from? Who is her family? I would have called in sooner and said, “Here is the sequel. Here’s the idea,” and we wouldn’t have had to wait so long. But no, I think when you really think about it, I actually don’t think it is tragic. You can look at it that way but as you see in the film now, what appears to be a disability is her strength and it turns into what would Dory do? So, what appears to be a disability is actually something we can look at in another way and say, “That’s a different way of thinking and it’s a good way of thinking.” I love that message in it that something that seems to be a handicap is something you can use as a strength. 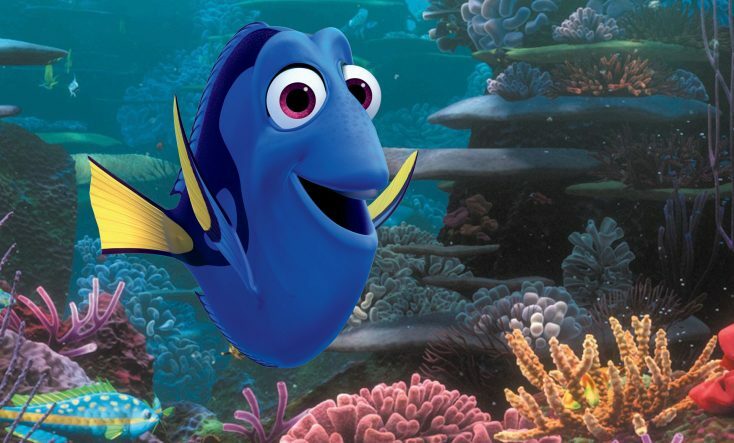 Q: Dory’s slogan is “Just Keep Swimming.” What did you put into that and how do you make Dory universal? DeGeneres: The “Just Keep Swimming” came from Andrew (Stanton, the director) who wrote it. That was him. I think it’s so much more than a cartoon movie and I think we’re all so proud of this. It’s much more complex and layered than any of us thought it would be. It’s much more complex and layered than Nemo and Nemo was a great movie but there’s so many layers to this and it is a very personal story for Dory and it is emotional so it was very easy for me to cry. I couldn’t read the lines and pretend to get emotional. It was emotional and really sad. Anything that Dory was going through had feeling. These are the same feelings we all have and it does show the power of these animators how they make it so beautiful and realistic and the characters they create as so complex that you do get emotional and you do cry at a fish. I couldn’t read the lines and pretend to sniffle and pretend to get emotional. We all cry. It really is a beautiful story. So, it was fun and challenging to get that emotional with just your voice and no body language to attach to that. I think it’s a credit to the writing as well. Q: Did you feel a connection to Dory from the beginning? DeGeneres: Well, I think everybody is searching for his or her home. I understand what a sense of belonging is. I understand when you say, “Why am I who I am? Where did I come from and how did I end up where I am?” So yeah, I can relate to that. I think everybody can. 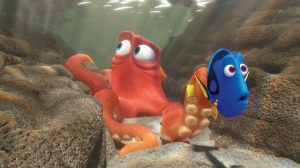 Q: Marlin is very analytical about a problem and Dory just goes with the flow. Which are you? DeGeneres: Both. I do both. It just depends on the situation. I do analyze. I look around. I kind of observe and analyze all kinds of things. I try not to do anything irresponsible but I do also like to be spontaneous and sometimes take chances. Q: Did the animators try to make Dory look like you? DeGeneres: Someone has said she does look like me. I don’t see it personally but as I’m talking they’re filming the entire time to get my facial expressions and what I’m doing so that’s how they come up with the look for the fish. I don’t see it but okay. Q: If you met your younger, childhood self, what would you tell her? DeGeneres: As you get older and wiser and start looking at life in a completely different way. You can tell a six-year-old something and they’re going to go “uh-huh.” I would tell that six-year-old that life is a very interesting journey and that it is filled with surprises and sometimes the surprises are good and sometimes they are bad surprises but they’re all good because even the bad ones get you ready for something else and they build another part of you that you wouldn’t have inside of you and that I think we’re made up of all kinds of different things. If we’re just made up of joy and love and only good things happen to us, we’d be a little less layered. I would tell that to a six-year-old. Just take everything in and embrace the bad with the good and just keep swimming.